At Chicago’s International Manufacturing Technology Show (IMTS) last month, HP Inc revealed metal additive manufacturing technology that makes the competitive manufacture of batches of tens of thousands of metal parts possible via powder-based additive manufacturing (AM). Some 40+ customer examples were displayed at the exhibition. Initially supporting stainless steel 316L parts, it is a development of so-called binder jet technology – metal powder ‘glued’ together to form ‘green’ parts that then go on to be sintered in a standard furnace. But, crucially, it is up to 50x more productive than existing binder jet or laser melting additive processes, the company claims. Given as examples were two low-weight parts that require tooling to produce them via metal injection moulding (MIM). HP’s new Metal Jet process is said to break even with MIM at up to 55,000 parts for an automotive roller-finger follower used in variable valve timing duties, while for a medical ‘tissue grasper’ that point is up to 65,000 units. Complex small parts required in volumes of up to around 50,000 that require tooling to produce them, so MIM, casting or pressed parts, are the current focus, but complex machined parts are also a target for the technology. “Killer applications are fluid dynamics, lightweighting and heat transfer,” says Dr Tim Weber, HP’s global head of 3D metals (a figure of 30-40% is typically possible for lightweighting, says HP). But he says the company has not yet explored the upper limits and does not discount larger parts, say, small internal combustion engine blocks or heads. The possibility to add metal nano particles to change the phase of the steel has also been demonstrated, allowing for parts having varying properties. Resulting components have equal strength in all directions (isotropic), are above 99.5% dense and, being made from standard, multi-source ASTM powders, have mechanical properties that “fulfil all the requirements of ASTM and ISO standards” and, indeed, “exceed industry standards”, according to HP,which had parts independently tested at Swiss research institute Inspire (www.inspire.ethz.ch). Parts are already being made by companies that include: GKN, Parmatech, Johnson & Johnson, OKAY Industries, Wilo and Volkswagen. GKN is the world’s largest producer of metal sintered parts for the automotive and heavy industry sectors, making 13 million parts/day using 321,000 tonnes of steel or cast iron powder annually – currently only about 1,000 tonnes goes to additive manufacturing; Parmatech is a leading metal injection moulding firm with decades of history in that area, focusing on medical/healthcare parts’ production; OKAY Industries engineers and manufactures components and subassemblies for OEMs in medical, automotive and specialty markets; Wilo is a Germany-headquartered pump manufacturer; and global automotive giant VW makes 10.75m vehicles/year, 40,000/day, and is working with GKN. HP is working with others, too. The Metal Jet machines, which currently have a build volume of 430 by 320 by 200 mm (but can be scaled easily), will not be generally available until 2021, with limited availability occurring in 2020, although the acquisition cost has been stated as being $399,000, because that is what is required to support the economics of the process. Current build rates are not being quoted, but the target is hours, says Weber. The initial push is via a service that will be operated starting immediately by GKN, via a German base, and Parmatech, via a base in the USA, each boasting multiple machines. Live now, it is fronted by a web service that will undertake initial qualification of uploaded parts, as regards their suitability for production via Metal Jet, with commercial matters then falling to either GKN or Parmatech. This service will mature over 2019, with design rules and tolerance stacks for parts being investigated and developed for initial applications. In this way, HP expects to accelerate the adoption of metal additively-made parts and its Metal Jet manufacturing technology. Of course, GKN and Parmatech’s existing customers may also go direct. As Weber, who has notched up 25 years with the company, offers, HP is “the world’s best printing technology company”, with “number one market share in 2D printing; number one or two in every category, from $100 to $10m”. He spent 20 of his 25 years involved with 2D printing and says that for 3D printing that underpinning technology is “a core asset” and source of a “sustainable advantage”. Its printers are already supporting 24/7 production, “and that’s what we aspire to in the 3D world”, he says. 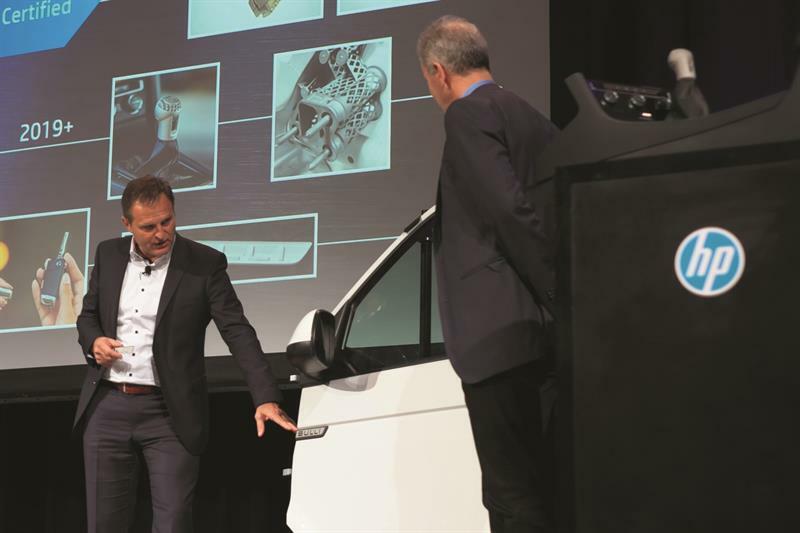 HP unveiled “the world’s first production-ready commercial 3D printing system” for plastics in 2016, the Multi Jet 4200; the 4210 was unveiled at the end of 2017, with that machine raising the break-even point for large-scale manufacturing to 110,000 parts versus injection moulding, compared to the 50,000 of the first 4200 machine. 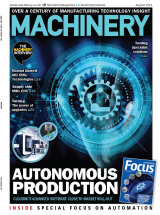 At the MACH exhibition this year, XYZ Machine Tools (https://is.gd/qixesi) and Matsuura (https://is.gd/sixeja) said they were going to offer this to their customer base (see feature: https://is.gd/aretej). A key differentiator for HP versus many 3D printing firms is its adoption of an ‘open platform’ approach to materials, allowing users to source standard materials from multiple suppliers, as they wish. Adopted for its plastics AM machines, it underpins Metal Jet, too, with this similarly supporting production economics fundamentals. The basic process for both Multi Jet and Metal Jet is similar: spread powder material (plastic or metal) across the bed; lay down the fusing or binding agent; fuse or bind using infrared for plastics and low-heat cure for metal powder (in or out of the machine; cure time varies with part thickness); remove fused, finished plastic parts or ‘green’ metal parts; then, for metal parts, the additional process of industry-standard, high-heat sintering. In both plastic and metal systems, material not fused/bound can be reused. But similar as they appear, the leap from plastic to metal 3D printing was not simple, says Weber. He highlights the differences between spreading plastic powder of 50 micron and metal powder of sub-10 micron size (“the flow-ability, consistency of layering, is a real challenge”), plus the technology of jetting a polymer binding agent versus a more liquid fusing/detailing agent as key challenges. The print bars through which agents are jetted are a core technology, developed internally by HP. And, rather like Moore’s law for computers, HP has continually driven up its nozzle density and capability. In 2012, the company introduced its PageWide inkjet technology that offered “laser-fast print speeds” via 1,200 nozzles per inch. HP uses that technology in web printers that are up to 3 m wide. Today, the company can lay down up to 100 billion drops/second, and that number will grow, meaning better resolution over time. Its Metal Jet technology uses these foundations with the machines featuring four printheads having two print bars each, with four nozzles able to deliver binding agent in the same 21 micron grid, providing a 4x redundancy – and that’s 4x that of other binder jet technology. Because the amount of binder employed in Metal Jet versus MIM is far less, the time to evaporate that off is shorter, taking up to 20 hours out of the workflow. And at 15%, shrinkage is less than for MIM. Post-processing of surface finish or to produce functional dimensional features may be required; Metal Jet produces parts with surface finishes of Ra 5-7 microns in X-Y and 25-40 Rz, with IT12 tolerances targeted (the latter similar to MIM). Almost alone among current purveyors of AM technology, HP is focusing on volume parts, industries and materials. Steel and iron are produced in a volume of 1,700m tonnes per annum globally, aluminium is second with 60m tonnes and titanium comes last with 200,000 tonnes. The automotive sector produces 81m+ cars/year and steel content is 51%, aluminium 12%; the industrial equipment sector produces 61m+ units, with steel content put at 50%; the medical sector (not implants) produces 36m+ units and again steel is in the majority. Aerospace by contrast is 1,700 units (although planes are large and contain high numbers of parts) and steel content is 23%, aluminium 42%. During the product launch keynote speech at IMTS (https://is.gd/veduho), GKN Powder Metallurgy CEO Peter Oberparleiter cited freedom of design as the number one attraction of AM, with weight reduction following that and becoming more important with electric vehicles. Reduced time to market – parts in two weeks not eight months – he put next, with scalable production via tool-less manufacturing following and linked to making powder metal-based production viable where it was not before at around that 50,000 units figure. Metal Jet is seen as opening up new business rather than providing an alternative route for existing parts for GKN. GKN’s customer Volkswagen was represented at the event by Dr Martin Goede, head of technology planning and development, who highlighted what the company sees as the application for Metal Jet. VW works with GKN on powertrain, chassis and interior parts. Goede said that GKN and Metal Jet “provide a window of opportunity to increase competitiveness”, citing increased productivity at its 100+ plants worldwide, improved vehicle functionality and boosting product attractiveness via AM opportunities. “Our key strategic topic is to apply 3D Metal Jet technology to mass production in the automotive sector,” he said. The global car giant has a three-stage plan. Shown off at IMTS were examples of mass customisation that took in personalised key fobs and car badges (the first phase, now), together with functional parts taking in a wing mirror mount – a single piece that previously took 16 separate items and now weighs 35% less but has greater stiffness – and a gear knob (both in the second phase expected next year and beyond). Safety-critical parts such as chassis elements are planned for 2021 in conjunction with existing and new electric vehicle platforms. Water pump maker Wilo has created a new impeller for its pumps, while Parmatech’s president Rob Hall says that while Metal Jet it will not compete with its established high volume MIM-produced part route now “we’re excited to see that grow in the future and excited to see where it goes in terms of design freedom...learning how to design for 3D is going to open so many possibilities that we don’t understand yet”. And of course, HP will use Metal Jet in its printer and PC business, reports Weber, but this is at an early stage, he says.